Today you complete your first investigative goal in our semester long project: assessing abundance of a soil microbial community by enumerating its microbes by two methods, one culture dependent and one culture independent. Today you will also continue acquiring and practicing skills used by working microbiologists. In addition, you will continue experiments along our other lines of investigation, specifically, our culture-dependent approach to isolating a few bacteria of interest from your soil community in order to provide examples of richness and community co-operative and competitive behavior.You will continue the process of selection and isolation to pure culture of a few of those bacteria for the next several weeks. Next week we will begin our experiments on the whole community of soil microbes: a community level, culture dependent assessment of a few aspects of richness and cooperative and competitive behavior. If you divide the number of colonies counted by the amount of inoculum plated times the dilution factor of that plate, you will obtain the number of cultivatable bacteria per gram of soil. Record the number of CFU/ gram of wet soil in your lab notebook and on the course spreadsheet on the instructor's computer at the front of the lab. Also add your data to the chalkboard for comparison with the other soil sampling sites. Note that this number is colony forming units/ gram WET soil. Record the number of CFU/ gram DRY weight soil in your lab notebook. If you are unsure of the accuracy of your calculations of CFUs per gram of wet soil weight and per gram of dry weight, check with your instructor. You will need accurate counts to set up community profiling analyses in LAB3. Why should you only have one plate with 30-300 colonies? Seal the edges of the dilute nutrient agar plate that your group counted with parafilm and store the plate in the cold room. Don't discard the other culture plates of dilute NA and NA + starch. You and your partners will examine them later to locate a diverse set of interesting bacterial colonies to try to isolate to pure culture as examples of bacteria in your diverse soil community. You can directly count a random sample of microbes from the soil extract that you prepared last week and extrapolate the number per gram of soil. 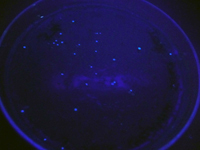 To make the microbes easier to count, your lab instructors stained the nucleic acids of your soil community microbes (not just the bacteria) with a fluorescent 4'-6-Diamidino-2-phenylindole (DAPI) DNA stain. All the microbes in a 1ml aliquot of the 1% soil extract that you prepared last week were transferred in a Poisson distribution to a small piece of filter paper. She viewed the fluorescent genomes of these microbes as discreet bright "spots" in 4 different areas of the filter paper distribution using fluorescence microscropy. These areas were photographed. These photomicrographs will be made available to you and your partners today. You will each count the discreet "spots" as individual microorganisms (one fluorescent genome/cell) from one area and perform the calculations described below to assess the total microbial concentration in this culture-independent enumeration of your soil community's microorganisms. Compare this number to the calculation of CFUs/gram of wet soil (a culture-dependent assessment) that you will also obtain today. Compare the two counts that, in theory, should be the same since we are using two methods to figure out the same thing: how many microbes per gram comprise your soil community. The answer will provide evidence for one of our investigative goals: abundance or microorganisms in your soil community. What does it mean if your two experimental methods don't give the same answer? Add 40μL of paraformaldehyde to make a 4% solution that will act as a preservative for the microbial cells in your soil extract samples if there is not time to process the samples immediately. Incubate at 4°C for 20 min in the dark . Rinse with 1 ml sterile deionized water to remover any background DAPI. Each member of your soil sampling group will use a different photomicrograph of a representative field of view (photos provided by your lab instructor) to count the fluorescent DNA (microbes) and calculate the number of organisms in 1gm of soil. The area of each field of view at 1000X using the Fluorescent scope is 10487μmeters2. The diameter of the filterable section of the borosilicate apparatus is 17 mm (8500μmeter radius). Therefore, the area is 2.269 X 108μmeter2. Multiply the number of microorganisms counted on the photomicrograph by a factor of 2.16X104 (2.269 X 108μm2 divided by 1.0487 x 104μmeters2) to determine the number of organisms found in 1mL of filtrate of extract. Then correct for the 1:100 dilution factor of filtrate which is the number of organisms in 1 gram of wet soil. Convert this to the number of organisms in the community in 1 gram of dry weight soil. Post your mean (average of the 4 areas of the filter counted) number of microbes/gm of soil to the spread sheet on the instructor's computer and on the board (all calculations must also be in your lab notebook!) from both the culture-dependent and culture-independent enumerations. Report them as the estimated number of microorganisms in 1gm of wet weight soil and 1gm of dry weight soil. Record these numbers in your lab notebook in scientific notation and as numbers (with an amazing number of zeros). Consider the relative insignificance of one gram of anything and the enormity of the number of microbes that thrive in a gram of soil! How is it possible that each of the microbial members of such a soil community can find a niche, obtain all the nutrients needed to grow and reproduce, and contribute to overall health of the soil and to the community of microorganisms? Each student will use a new sterile cotton swab dipped into their oven-dried-soil extract to set up an enrichment/selection culture for spore-forming bacteria on a plate of glycerol yeast extract agar (GYEA) following the directions below (also found in the Enrichment Media for the Isolation of Soil Bacteria in a Mixed Population: Finding Spore Forming Bacteria in the Protocols: Culture Media section of this wiki). Swab section 1 of a pre-labeled plate of glycerol yeast medium (GYEA) with the swab dipped in your oven-dried-soil extract using your best isolation streak technique. Each group should take a loopful of the slime from the pellicle (media surface) or from the side of the flask and place it into 1 ml of sterile water in a small tube. Cap the small tube and place the capped tube into an empty 16 mm tube. Each student should isolation streak from that tube of vortexed slime onto two plates of Azotobacteria agar medium suspension, using your best isolation streak technique. (Follow the protocol in Streaking for Isolation ). Continue to isolation streak to make sub-cultures onto fresh Azotobacter medium or on NA until you are sure that you have a pure isolate. Note that your bacteria will probably grow better on NA and it is fine to switch to nutrient agar after the initial selection. Parafilm and save any plate that contains a colony you or your teammates are attempting to isolate. Store this plate(s) in the refrigerator. Discard unused cultures. Follow the directions carefully that are found in Streaking for Isolationin the Protocols section of this wiki. Transfer bacteria from one of your selected colonies to the O zone of a new NA plate. Someone from your team must go to the Greenhouse and collect a new soil sample from your sampling site. On the day of lab next week, BEFORE lab begins, stop by the lab to pick up a plastic bag containing materials for collecting a new soil sample from your sampling site in the greenhouse. You will only need enough soil to fill half of a sterile, small 15ml, orange capped, conical tube. Make sure you get the sample for THE SAME sampling site as your original sample. Again avoid the top few millimeters of surface soil and wear gloves to avoid contaminating the sample with bacteria from your skin. You probably won't need to use the corer; a disinfected metal spatula or even a spoon should work fine. Write a draft Introduction section of your final paper that includes a explanation of the "Great Plate Count Anomaly". Be sure to read the full directions for this assignment found at: Lab 2 Assignment: Assignment: Introduction. Remember that this introduction will NOT use the data you collected this week on the number of microbes in your soil community. You will use that evidence in next week's assignment. This page was last edited on 7 February 2012, at 10:07.